Chemical peeling is a technique used to improve the appearance of the skin. In the treatment, a chemical solution is applied to the skin that causes it to react and eventually peel off. New, regenerated skin comes to the surface to replace the skin that falls away. This new skin is smoother and more evenly pigmented, with fewer lines and wrinkles. It is generally performed on the face, neck and hands. Denver chemical peel options include alpha hydroxy acid, beta hydroxy acid, retinoic, glycolic, and lactic acids, and may be customized to correct acne, sun damage, and oily or aging skin. Since there are many options, we always recommend a consultation with one of our professionals to help determine the right peel for your skin type, tendencies and needs. The Lactic Acid Peel is alpha hydroxy acid that exfoliates the outer layer of your skin to encourage new cell turnover. This particular chemical peel is a natural humectant and pulls moisture from the collagen level to the surface of the skin, deep cleaning and eliminating toxins and dead skin cells. It is an excellent acid choice for dry and sun damaged skin. Lactic acid is derived from milk and is much milder on the skin than Glycolic or Salicylic peels. This is a great peel for people with sensitive skin. The Lactic Acid Peel will fade dark marks, improve hyperpigmentation, brighten and lighten skin, improve the appearance of light wrinkles, and stimulate collagen. It can be used for treatment of the following: acne, acne scars, blackheads/whiteheads, dry skin, sun damaged skin, blotchy pigmentation, fine wrinkles, loss of elasticity, large pores, in-grown hairs, age spots, eczema, Seborrheic Keratosis, Hyperkeratosis, and Actinic keratosis. A Glycolic Chemical Peel is an alpha hydroxy acid used for exfoliating the skin. It is derived from the sugarcane plant, and because of the small molecular size, it penetrates the top layer of skin and dissolves the glue that holds the cells together, which allows dead cells to slough off revealing newer more vibrant skin. The purpose of the glycolic peel is to enhance beauty by smoothing out the skin, evening skin tone, reducing acne scars and reducing the appearance of wrinkles. This peel gives the skin a healthy glow relatively quickly. It stimulates new cell division, resulting in new, healthy cells. Fine lines are diminished and the skin is left softer and smoother. Acne and blemishes will decrease, while skin discolorations and surface sun damage are reduced. Age spots will lighten and leave skin tone more uniform. The Salicylic Peel is excellent for improving skin tone, minimizing fine lines and wrinkles, removing whiteheads and blackheads, blotchy pigmentation, large pores and sun-damaged skin. It is an effective exfoliating agent and can improve the appearance of skin that is affected by acne. Salicylic acid loosens and removes aging cells, oil and debris attached to the skin’s surface, stimulates new cell production and increased collagen formation and is oil soluble and lipophilic. Therefore it is able to penetrate sebum filled follicles and clean out clogged pores, which results in noticeable improvement in acne prone skin. Salicylic acid is a beta hydroxy acid and has anti-inflammatory properties that can help to reduce any inflammation and irritation after the use of the peel. It is ideal for oily complexions as well as people with sensitive skin. A Mandelic Peel is great for all skin types. It has a low irritation factor and is excellent for fine lines, acne, Rosacea, and pigmentation. The Jessner Chemical Peel is a superior treatment and a deeper peel designed to remove superficial layers of skin. This peel combines resorcinol, lactic acid and salicylic acid to result in deeper penetration and great exfoliation of the outer layers of skin cells. The deeper exfoliation produces noticeable flaking and exfoliation in the three to four days following the peel. Within a week, a new layer of smoother, healthier skin will emerge. A Jessner peel consists of a minor peeling agent that can be used to lighten areas of hyperpigmentation and to treat aged sun damaged skin. It is excellent for most skin and particularly good for treating patients with acne, oily or thicker skin, because it tends to decrease oil production and open clogged sebaceous follicles. It also contributes to the healing process of acne. It smooths and rejuvenates skin, producing beautiful results in treating mild to severe acne, discoloration, moderate wrinkling and sun damage. This peel can be done on the face, neck, hands and upper chest, based on need. TCA is the acronym for Trichloracetic Acid, and this peel is a chemical peel that will cause skin to physically peel. The results are beautiful, and it does require a little longer down time while the skin peels to reveal new, healthier skin underneath. It brightens skin and evens out skin tone by reducing the appearance of hyperpigmentation, dark spots, age or sun spots, acne marks, mild scarring, sagging skin, freckles and fine wrinkles. It can also minimize the appearance of skin tags. When TCA is applied to the skin, it causes the top layers of the cells to dry up, crust and peel off over a period of several days to one week. It may take up to a week for this portion of the healing process to complete. When the old skin peels off, it exposes a new layer of undamaged skin, which has a smoother texture and more even skin tone. Redness and some swelling may remain post peel, and it can take up to six weeks for this to completely diminish. The ultimate result is fresher, smoother, younger looking skin. One TCA Peel will give a better, stronger result than a Glycolic Peel, but more than one TCA Peel is often recommended for optimum results. A TCA Peel penetrates more deeply than alpha hydroxy acid peels, such as Glycolic or Lactic Peels. The benefits of a deeper peel such as this are thus increased through one treatment. 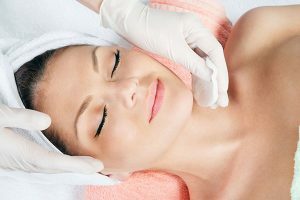 There are two percentage options for the TCA Peels we offer, one that is medium and one that is a higher percentage which will penetrate deeper. The MandeliClear Peel can be classified as a modified Jessner Peel with Mandelic acid added to it. Mandelic acid is derived from almond or wild cherry. The treatment is very effective at lightening pigmentation issues for people with darker skin types such as Asian, Indian or African American skin without risk of post inflammatory reactions. Additionally, it is an excellent solution for any skin type with pigmentation issues due to acne, melasma or photodamaged skin. The Vi Peel is designed to reverse the signs of aging and sun damage. Its synergistic blend of gentle yet powerful ingredients can improve the tone, texture and clarity of your skin. It works to reduce and/or eliminates age spots, freckles and hyperpigmentation, and clear acne conditions, while softening lines and wrinkles. The Vi Peel can also be used to treat sun damage on the décolletage and hands. This virtually painless treatment takes only 20 minutes and requires minimal healing time. It is a great and effective peel for darker pigments, hyperpigmentation and melasma. Come visit Spa Bella Medi Spa for your Denver chemical peel today!